“City of Champions” is the title of a mural painted in 2015 on the side of Spike’s Trophies at 2701 Grant Avenue in Philadelphia. 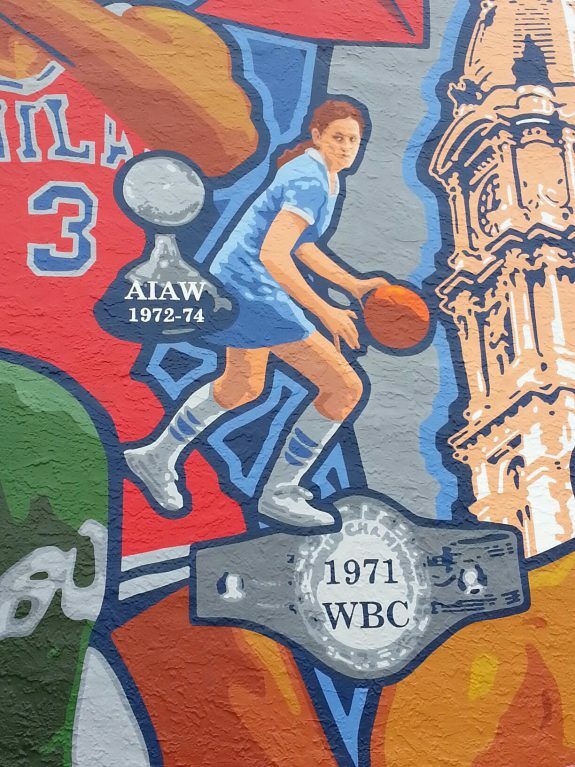 The mural pays homage to Philadelphia championship winners from multiple sports, and this detail from the mural shows a Mighty Macs player, representing the three AIAW Basketball championships won by Immaculata College (now Immaculata University) between 1972 and 1974. The Mighty Macs championship team’s legacy has not gone unnoticed in the world of sports. Cathy Rush, her Mighty Macs championship-winning squads, and a few individual Mighty Macs players who also found basketball coaching success have been enshrined in Basketball Hall of Fame organizations in the United States. Rush was inducted into the Naismith Basketball Hall of Fame in 2008, and her 1972-1974 teams followed suit by being inducted in 2014. Theresa Grentz was a Mighty Macs player who was part of all three Immaculata AIAW championship squads. Grentz went on to coach basketball at Saint Joseph’s University, Rutgers University, Illinois University, and Lafayette. In 2001, Theresa Grentz was inducted into the Women’s Basketball Hall of Fame. Another Mighty Macs championship-winning player, Marianne Crawford Stanley, also went on to coach NCAA women’s basketball and professional basketball for the Women’s National Basketball Association. Stanley was inducted into the Women’s Basketball Hall of Fame in 2002. The Mighty Macs’ winning history has also reached the silver screen. The feature-length Mighty Macs, directed by Tim Chambers, was initially shown at the Heartland film festival in 2009 and officially released in 2011. The film focuses on their rise to prominence and their struggles as underdogs in women’s basketball. There were fewer close calls in the Macs’ 1973 AIAW championship run. They handily defeated their first two opponents, Indiana State (59-48) and Western Washington (66-53,) by more than ten points. In their third game, the Macs had a tougher time against Southern Connecticut State University, but won 47-45. After that victory, the Immaculata team returned to the AIAW finals for the second year in a row. Immaculata’s opponent was Queens College of New York, which they defeated 59-52, earning the team its second championship in a row, and Cathy Rush’s second championship as Immaculata head coach. Rush and the Mighty Macs also captured the AIAW championship in 1974, making three in a row. 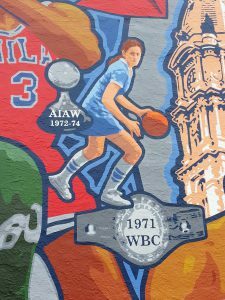 In 1972, the Immaculata Women’s Basketball program faced financial struggles that almost kept the team from competing in the AIAW national tournament in Illinois. But Sister Mary of Lourdes, the Immaculata president, organized fund-raising efforts for the “Mighty Macs” women’s basketball team so that players could be flown to Illinois. Ultimately the school raised enough to send eight out of twelve players to the tournament. The Mighty Macs were not favored to win the championship, but the women showed determination and knocked their first three opponents out of the tournament en route to the finals. In the first game, the Macs overcame South Dakota State 60-47, then defeated Indiana University (49-47) and the Mississippi State College for Women (46-43). Each game was close, as Immaculata won two of its first three games by a three-point margin and defeated Indiana University by a single basket. In the finals, the Mighty Macs had another close game with West Chester University, winning 52-48. After almost failing to make it to the tournament, Coach Rush and the 1972 Mighty Macs were crowned AIAW champions and won their place in basketball history. The coach and her team repeated their winning ways in the 1973 and 1974 seasons. 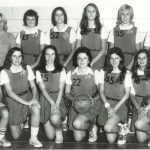 The Immaculata College women’s basketball teams of the early 1970s, known as the Mighty Macs, won the first three national tournaments of the Association of Intercollegiate Athletics for Women (AIAW) in 1972, 1973, and 1974. Basketball brought the Immaculata community together, and Immaculata’s success showcased the high quality of basketball played by Philadelphia’s Catholic schools. 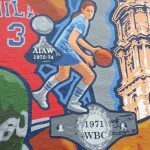 The success of the Mighty Macs built upon a tradition of basketball at Immaculata that began in 1939 and drew skilled Philadelphia area female basketball players to its all-women’s campus. The highlight during the early years was defeating the Temple Owlettes in 1946, winning the unofficial City Championship and handing Temple its first defeat in four years. 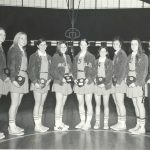 After the Commission on Intercollegiate Athletics for Women (CIAW) experimented with full-court basketball during the 1969-70 and 1970-71 seasons, women’s college basketball officially changed in 1971 with the formation of the AIAW, and the game transitioned from the half-court game (three players on each side) to the full-court game with five players on the court. At Immaculata, Coach Cathy Rush (b. 1947), a graduate of West Chester State College (later West Chester University), implemented strategies used in the men’s game. Players trained by running to gain endurance, and during the 1971-72 season the training paid off. The Mighty Macs went 24-1, with their only loss to West Chester in the regional finals. As a small private liberal arts college, Immaculata did not have a recruiting budget or athletic scholarships, and its starters carpooled to campus for morning practices. Seeded fifteenth in the 1972 national tournament, the team almost did not make the trip to Illinois because of the cost. To raise money, players sold toothbrushes. Sister Mary of Lourdes (1915-2005), the college president, persuaded each of the trustees to pay for plane fare for one player. Ultimately, they raised enough money to fly eight players (out of twelve) and one coach on standby to the tournament. They won their first three games, then defeated archrival West Chester for the national championships. The 1973 team went undefeated, beating Queens College in the finals, and the 1974 team defeated Mississippi State College for Women in the finals. 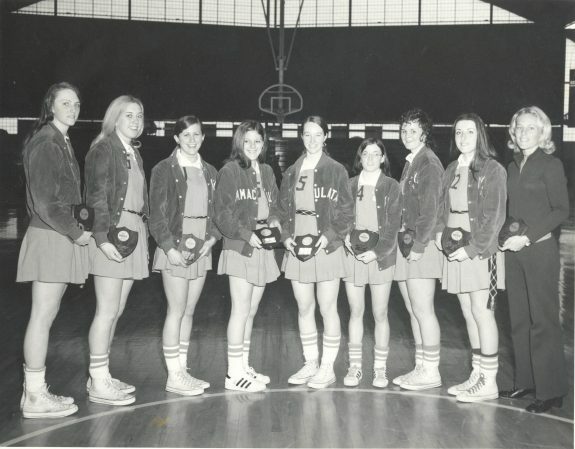 In addition, the Mighty Macs participated in the first televised women’s college basketball game, defeating the University of Maryland on January 27, 1975. The 1975 and 1976 teams also reached the finals, losing to Delta State University in Mississippi both years. 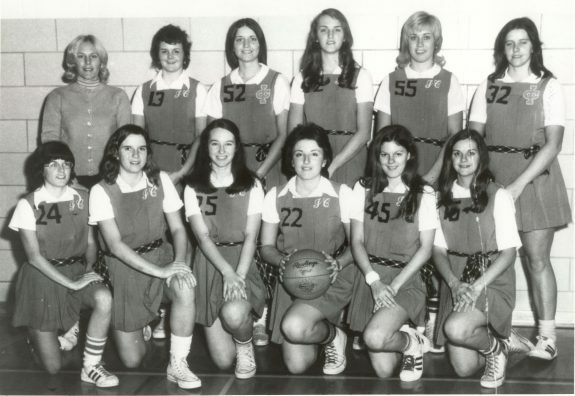 Cathy Rush left Immaculata in 1977 after compiling a record of 149-15. Some of her star players went on to become successful women’s college basketball coaches. Among them, Marianne (Crawford) Stanley (b. 1954) led Old Dominion University to the AIAW championship in 1979 and 1980 and to the NCAA Women’s Division I Basketball Championship in 1985. Theresa (Shank) Grentz (b. 1952) coached Rutgers to the 1981 AIAW national championship, and Rene (Muth) Portland (1953-2018) coached for twenty-seven seasons at Penn State University. The implementation of Title IX of the Education Amendments of 1972 and the subsequent inclusion of women’s sports in the NCAA spelled the end of the Mighty Macs’ dominance, as they did not have the financial resources to offer athletic scholarships to team members as their competitors did. However, the Mighty Macs continued to be remembered. The adventures of the first championship team were loosely portrayed in the award-winning feature film The Mighty Macs (2009). Coach Cathy Rush was enshrined in the Naismith Memorial Basketball Hall of Fame in 2008, and the 1972-1974 national championship teams were inducted in 2014. Rush (2000), Grentz (2001), and Stanley (2002) have also been inducted into the Women’s Basketball Hall of Fame. Karen Guenther is Professor of History at Mansfield University and author of Sports in Pennsylvania (2007), published by the Pennsylvania Historical Association. The Mighty Macs. Directed by Tim Chambers. Quaker Media, 2009. DVD distributed by Sony Pictures Home Entertainment, 2012. Immaculata University Archives, Gabriele Library, Immaculata University, 1145 King Road, Immaculata, Pa.
Immaculata University, 1145 King Road, Immaculata, Pa.
Naismith Memorial Basketball Hall of Fame, 1000 Hall of Fame Ave., Springfield, Mass. Women’s Basketball Hall of Fame, 700 Hall of Fame Drive, Knoxville, Tenn.